​Alī ibn Mūsā al-Rezā (Arabic: علي بن موسى الرضا‎) also called abu al-Hasan is commonly known as Ali al-Reza (c. 29 December 765 – 23 August 818) also commonly known in Persia as Imam Reza (Persian: امام رضا), was a descendant of the Prophet Muhammad and the eighth Shia Imam. The eighth Imam had reached the Imamate, after the death of his father, through Divine Command and the decree of his forefathers, especially Imam Musa al-Kadhim, who would repeatedly tell his companions that his son Ali would be the Imam after him. As such, Makhzumi says one day Musa al-Kadhim summoned and gathered us and entitled him as "his executor and successor." According to Donaldson he was twenty or twenty-five years old when he succeeded his father as Imam in Medina, and it was about eighteen years later, when the Caliph Al-Ma'mun "undertook to ingratiate himself with the numerous Shia parties by designating Ali ar-Ridha as his successor to the Caliphate. After the death of Harun al-Rashid in 809, Harun's two sons began fighting for control of the Abbasid Empire. One son, Al-Amin, had an Arab mother and thus had the support of Arabs, while his half-brother Al-Ma'mun had a Persian mother and the support of Persia. After defeating his brother, al-Ma'mun faced many insurrections from the followers of the Prophet's family in many areas. 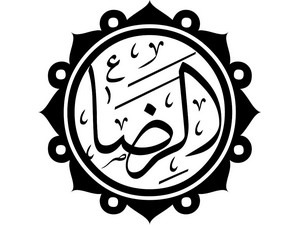 The Shia of al-Ma'mun's era, like the Shia of today, who made a large population of al-Ma'mun's Iran, regarded the Imams as their leaders who must be obeyed in all aspects of life, spiritual and terrestrial, as they believed in them as the real caliphs of the Islamic Prophet, Muhammad. The Abbasids, like the Umayyads before them, realized this as a big threat to their own caliphate, since the Shias saw them as usurpers of al-Ma'mun which was far from the sacred status of their Imams. Allamah Tabatabaei writes in his book Shi'ite Islam, that in order to quiet the many Shia rebellions around his government, al-Ma'mun summoned Imam al-Ridha to Khorasan and wanted to offer him the role of Crown Prince to prevent the Shias and relatives of al-Ridha from rebelling against the government, seeing as they would then be fighting their own Imam; secondly, to cause the people to lose their spiritual belief and inner attachment to the Imams, because the Imam would be associated with the corrupt government of al-Ma'mun. Thirdly, he intended it to fool other Shias into believing that his government was not so bad after all, because al-Ridha would then come into power after al-Ma'mun. And fourthly, he wanted to keep a close watch over the Imam of the Shias himself, so that nothing could happen without al-Ma'mun's knowledge. Word spread quickly among al-Ma'mun's circles that al-Ma'mun was not sincere in his offer to make Ali ibn Musa al-Ridha the Crown Prince, and it was a political move. Al-Ma'mun also became paranoid and thought that al-Ridha would see through it as well, and so would his Shias. In order to quiet the doubts of the people, al-Ma'mun first offered al-Ridha the caliphate itself. Al-Ma'mun kept trying to make his offer seem sincere and kept re-offering the caliphate, and finally moved on to his real plan to make his Crown Prince be Ali al-Ridha. When Imam al-Ridha also declined this position, al-Ma'mun threatened him saying "Your ancestor Ali was chosen by the second caliph to be in a six member council to elect the third caliph, and ordered to kill any one of the six who didn't comply. If you do not accept the position of Crown Prince in my government, I will follow through on the same threat". al-Ridha said he would accept, under the condition that none of the affairs of government would be his. He would neither appoint anyone, nor dismiss. He would not rule, or pass laws. He would only be Crown Prince in name. al-Ma'mun became happy that al-Ridha had accepted and would stay out of his way in governing, and agreed to the condition. Al-Ma'mun even changed the black Abbāsid flags to green, the traditional color of Shia Mohammad's flag and Ali's cloak. He also ordered to mint coins with names of both Al-Ma'mun and Ali al-Ridha. Al-Ma'mun thought he would solve the problems of Shia revolts by naming al-ridha as his successor. After finally being able to persuade al-Ridha to accept this position, al-Ma'mun realized his mistake, for Shia began to gain even more popularity. Moreover, Arab party in Baghdad were furious when they heard that al-Ma'mun not only appointed the imam as his successor, but sent out commands that the Abbasid'd black flag should be changed to green in honor of the Imam. They were afraid that the empire would be liberated from them. They got together, therefore, to depose al-Ma'mun and gave allegiance to Ibrahim ibn al-Mahdi, who was the uncle of al-Ma'mun. When al-Ma'mun heard this Imam advised him to solve the problem by dismissing him from his position but he did not heed and decided to return to Baghdad and assert his rights. However, when they reached the town of Sarakhs, his vizier was assassinated, and in a couple of days, when they reached Tus, al-Ma'mun poisoned imam. Then Muhammad Taqi imam's son came. Al-Ma'mun ordered that he be buried next to the tomb of his own father, Harun al-Rashid, and showed extreme sorrow in the funeral ritual and stayed for three days at the place. According to Madelung the unexpected death of both the vizier and the successor, "whose presence would have made any reconciliation with the powerful ʿAbbasid opposition in Baghdad virtually impossible, must indeed arouse strong suspicion that al-Ma'mun had had a hand in the deaths."